Before his return to the Philippines to resume the revolution, General Emilio Aguinaldo had a flag sewn in Hong Kong. This was the flag displayed during the declaration of independence on June 12, 1898 in Kawit, Cavite which, since then (with minor modifications) had become the national flag of the Philippines. On February 12, 1998, President Fidel Ramos signed Republic Act 8491, known as the "Flag and Heraldic Code of the Philippines," prescribing the code of the National flag, anthem, motto, coat-of-arms and other heraldic items and devices of the Philippines. Under Section 26 of this code, the official celebration of "Flag Days" was prescribed from May 28 to June 12. May 28 as "Flag Day" was first proclaimed in 1965 by President Diosdado Macapagal. This day commemorates the date when the Philippine flag, brought home by General Aguinaldo was first unfurled. May 28, 1898 was the date of the first military engagement of Filipino revolutionary forces in the renewed revolution against Spain. Also considered as their first major victory, it inspired General Aguinaldo to display for the first time, the Philippine flag. 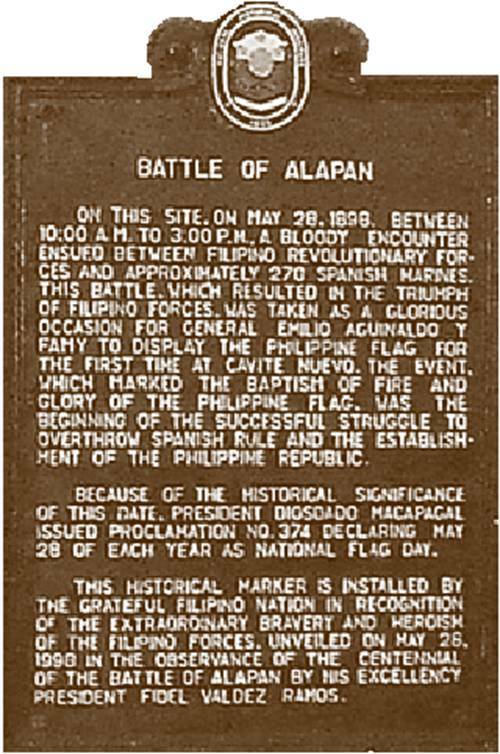 But while the battle took place in Alapan, Imus, Cavite; the first unfurling of the flag, contrary to some history textbook accounts, happened in Cavite City, then known as Cavite Nuevo (new Cavite) or Cavite Puerto (Cavite Port) where the army's Cuartel Heneral, the Teatro Caviteño was located. On May 19, 1898, between noon and one o'clock in the afternoon General Emilio Aguinaldo arrived in Cavite from Hong Kong aboard the revenue cutter McCulloch, which was sent for him by American Admiral George Dewey. Dewey was responsible for the destruction of the Spanish Armada in Manila Bay on May 1, 1898, in the naval battle that brought the Spanish-American War to the Philippines. General Aguinaldo, with his adjutant and secretary Colonel Jose Leyba, met him for the first time aboard his flagship, USS Olympia; where they talked about the previous conferences initiated by U.S. Consuls E. Spencer Pratt and Rounseville Wildman between the 22nd and 25th of April 1898. Dewey and Aguinaldo also discussed the arms shipment being delayed in China for which, Dewey offered to dispatch a streamer to expedite its arrival. Dewey was said to have also advised Aguinaldo that should they destroy the power of Spain, the hoisting of a Philippine National Flag would appear more important and credible in the eyes of the world and the United States in particular. After the meeting with Admiral Dewey, General Aguinaldo went directly to the shorelines of Cavite Puerto to meet the revolutionary forces from Bataan purposely to hand the order of general uprising in the provinces of Bataan and Zambales. The following day, May 20, 1898, seventy two Filipino (Spanish military) volunteers from San Roque and Caridad armed with Remington and Mauser rifles surrendered to General Aguinaldo and they were dispatched to Dalahican, Cavite to prevent the Spanish soldiers from entering Cavite Puerto. On the same day sixty two Mausers with rounds of ammunition, seized from a Spanish warship and brought from Corregidor Island by the USS Petrel, arrived at the dock of the Cavite Arsenal and immediately distributed to the revolutionaries. On the night of May 20, 1898, Aguinaldo sent General Luciano San Miguel to the revolutionary armies of Manila, Laguna, Batangas, Tayabas (Quezon), Bulacan, Morong (Rizal), Pampanga, Tarlac, Nueva Ecija and other parts of Southern Luzon to carry the order to raise arms against the Spaniards. Copies of the order also circulated in the province of Cavite. General Aguinaldo took temporary residence at the headquarters of the Naval Commander in Cavite Arsenal. However, when the revolutionary troops began to arrive on May 21 and May 23, he left the Cavite Arsenal and transferred his military headquarters to the mansion of fellow Mason Maximo Inocencio, at Calle Arsenal, Cavite Puerto (now P. Gomez St. in Samonte Park, Cavite City). The Maximo Inocencio mansion was then made also his temporary residence and the Teatro Caviteño, adjacent to the walls of Porta Vaga his temporary military headquarters. 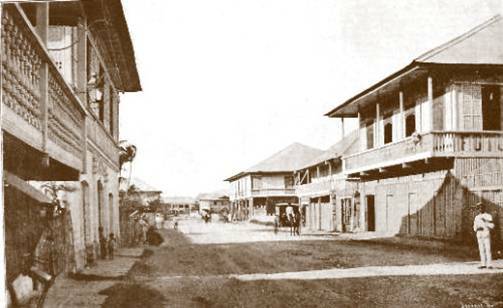 General Aguinaldo later transferred his dictatorial government to the former Casa Gobierno Civil of the Spanish authorities, also in Cavite Puerto. 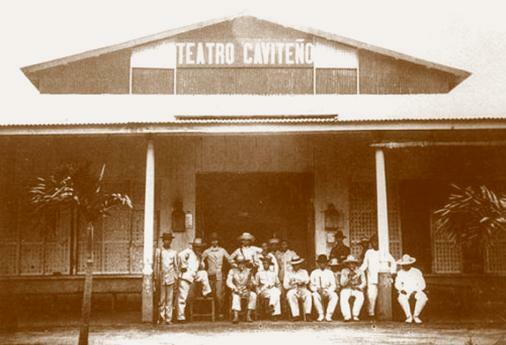 On May 25, 1898, Teatro Caviteño was established as the Cuartel Heneral or Military General Headquarters. 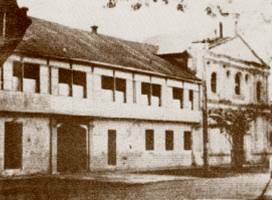 Aguinaldo also established the Hospital de San Juan de Dios for the Filipino revolutionaries. It was while he was at the Casa Gobierno Civil when the arms shipment consisting of 1,999 rifles, 200,000 rounds of ammunitions, and other special armaments of war arrived at the dock of the Cavite Arsenal. The armaments were immediately distributed to various provinces; reserving a portion for the Revolutionary Army of Cavite El Viejo (Kawit troops). The battle of Alapan was an unexpected event. On the evening of May 27 in preparation for the general uprising scheduled for May 31, 1898, the Revolutionary Army of Kawit started distributing firearms and ammunition in Alapan, Imus, Cavite. The following day, May 28, while still distributing firearms, the army saw Spanish Military columns composed of more than 270 Naval Infantry led by Captain Pedro Castila (Pedro Janolino). The troops were sent by Spanish Brigadier General Leopoldo Garcia Peña for the purpose of seizing the reported consignment of arms. Fierce fighting erupted at 10:00 o'clock in the morning and lasted until 3:00 in the afternoon. The Filipino troops emerged victorious and the Spaniards surrendered when they ran out of ammunition. Together with all the confiscated firearms, the Filipino revolutionaries brought the captured Spanish soldiers to Cavite Puerto. They presented the prisoners to General Emilio Aguinaldo. In acknowledgement of the first victory of the Filipino Revolutionary Army, General Aguinaldo brought out the Philippine flag and in the presence of his men and the crowd unfurled and hoisted it amidst the tremendous applause and loud, spontaneous and prolonged cheers for “Independent Philippines.” The event was witnessed by several officers and marines from the American Squadron. The arrival of the captured Spanish soldiers and the hoisting of the first Filipino flag in front of Teatro Caviteño was also witnessed by Felipe Buencamino, an emissary of Governor Captain General Basilio Augustin. He was at the tower of the Osorio mansion detained, by order of General Aguinaldo upon advice of Ambrosio Rianzares Bautista and Felipe Calderon. Buencamino remained guarded by General Mascardo until June 6, 1898. Again, the Philippine flag was hoisted on the day of the planned general uprising, May 31, 1898, when Filipino troops gained their second victory in Binakayan a barrio of Kawit, as they overran the Spanish Polvorin (powder-magazine) and garrison where 250 Spanish soldiers were captured. The flag was also seen flying over the steeple of the church in Bacoor after a garrison of about 300 Spanish troops surrendered to the Filipino Revolutionary Army. This document represents the formal act of surrender of General Leopoldo Garcia Peña, Spanish military commander of Cavite and the entire Spanish garrison in the town of San Francisco de Malabon (General Trias), Cavite to the Filipino forces under General Mariano Trias represented by Ladislao Diwa. General Leopoldo Garcia Peña had 2,800 Spanish troops during the resumption of the revolution. But his troops were scattered in various detachments in Cavite province and out numbered by the combined forces of Generals Luciano San Miguel, Mariano Noriel, Artemio Ricarte and Juan Cailles who had about 6,000 to 8,000 troops. A force of 500 infantrymen dispatched to reinforce General Peña was stopped by a combined force in Laguna under Generals Paciano Rizal and Pio del Pilar. By nightfall of May 31, the whole province of Cavite was in the hands of revolutionaries. Surrounding provinces soon followed. According to Dr Augusto V. de Viana, chief history researcher of the National Historical Institute (now Commission) the historical error in history textbooks and commemorative rites that placed the first display of the Philippine flag in Alapan, Imus Cavite on May 28, 1898 could be attributed to Proclamation No 374, issued on March 6, 1965 by then President Diosdado Macapagal. This proclamation declared May 28 of each year as Flag Day. “On the following day (May 28, 1898) and at the time when the arms were delivered to those of Kawit, in said barrio, a column of more than 270 Spanish soldiers, of the Marine Corps, surrendered, which was sent by the Spanish General, Sr. Peña, in pursuit of said arms. Teatro Caviteño was built by one of the wealthiest residents of Cavite Puerto, Don Esteban Jose y Lazareto in 1885. It was located in front of Ermita de Porta Vaga at Plaza Soledad, now part of Samonte Park, Cavite City.